This question is often code for: I don’t know how to estimate rehab costs, so how can I get a contractor to help me perform my due diligence on a property by coming up with a Statement of Work (SOW) and estimating it so that I can put in an offer? You have decided to jump into flipping because that’s how you build up your war chest to start using the BiggerPockets BRRRR strategy. You have no construction estimation experience, but you have just found your first distressed property on the MLS, through a property wholesaler, or just driving for dollars, and are dying to get started. You also probably don’t have existing relationships with contractors. Unfortunately no self-respecting contractor will come out to bid on a property which you don’t either own, or have in escrow after putting an offer on it. At least not for free. More on that later, so what should you do? One piece of bad advice that I’ve seen recently is to put in an offer on the property conditional on inspection so as to figure out the rehab costs later. Sure, after putting in an offer you have some skin in the game so that a contractor will be willing to come out to “your” property, and now you can even rely on a property inspector as part your inspection period to tell you what’s wrong with the property. Right? Not so fast. There are two major issues wrong with this approach. You make money on the buy side, so your offer should be based on your ability to make the deal profitable, and it should include knowledge about how much it will cost you to make the property profitable. Please don’t rely on a contractor to come up with your SOW for you. Let me repeat. Your contractor is not the one responsible for creating your SOW. Your contractor will fix what you tell them to fix, so if you tell them to fix your house, you might end up rebuilding the whole thing. That’s never appropriate unless you want to lose your shirt or you’re running a charity. And please don’t rely on an inspector to come up with your SOW for you. Sure they’ll tell you what’s wrong with your property after a visual inspection, which you can learn to do yourself with books like The Complete Guide to Home Inspection (Amazon link), but they’re not house flipping experts and won’t tell you what you need to improve in order to make the property marketable. Seems like a Catch-22. What can you do? So how do you get a contractor to estimate rehab costs for you before your offer, if they will not come out to your property until after your offer? If you do know a contractor, you could possibly call in a favor one or two times to have them come out and give you an idea of how they estimate and teach you what they look for. You’ll run out of favors quickly though. While this is unsustainable for running hundreds of analyses, which is what you should expect to be doing before actually finding a profitable deal, $300 is a fair price for someone to come out and provide you with an estimate and timeline for your scope of work. I had this problem. We all have this problem when we start out, and the best remedy is education, supported by tools, which eventually turn to experience. For education you should at the very least read J Scott’s Book on Estimating Rehab Costs (Amazon link). It was instrumental in providing me the foundation blocks on what and how to estimate a potential rehab, and I highly recommend it. Of course you should read the House Flipping Guide’s post on How to Estimate Rehab Construction Costs. But you should not stop there, and should continue reading other books on the subject to develop your experience, some of which are recommended in the resources menu to the right. Additionally, you should get out of the house and attend one of the many property tour meetups. This is a great venue to learn about how others have come up with their SOW, and ask questions of your peers. This was one of the major reasons behind the genesis of the REIkit House Flipping Software: to allow me personally to quickly estimate my rehab costs as part of my property analysis, to come up with an offer that made sure that I was going to make money — this for the price of a single estimate if I were to ask a contractor to run one for me. But, if you’re still just educating yourself; you also have other free options out there such as Homewyze for example, which helps with breaking down estimates for a few common home improvement tasks. So to wrap it up: How do you get a contractor to bid on your property before you offer? 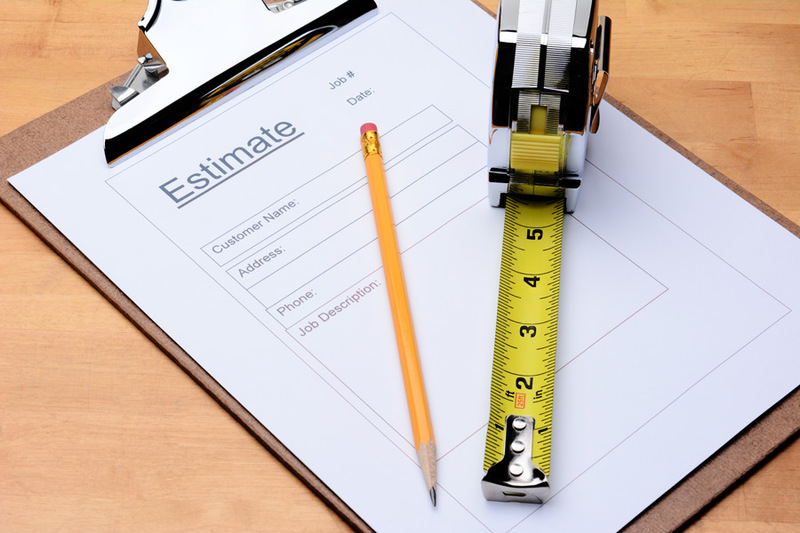 Do you have any tips on estimating rehab construction costs? Leave them in the comments below.